L to R: Lost in Space Classic B'9, 1997; Ultimate Iron giant, 1999, Robby the Robot, 1999. They're licensed: New Line Productions, Warner Bros., and Turner Entertainment. Left: At just under 20 inches, Ultimate Iron Giant earned his name. But his articulated joints could be moved so he could sit down, as in the top photo. He didn't walk, but he talked when you put the small, magnetic Hogarth on his shoulder, or pushed the button on his palm. His eyes also lit up and he could munch a small included statue, car, or tractor, since his mouth moved when he talked, which could then be removed from his back. Along with an outer space noise, he said four phrases from the film: "Hogarth, friend! ", Ahh, friend! ", "Hungry" and "Umm, yummy!". 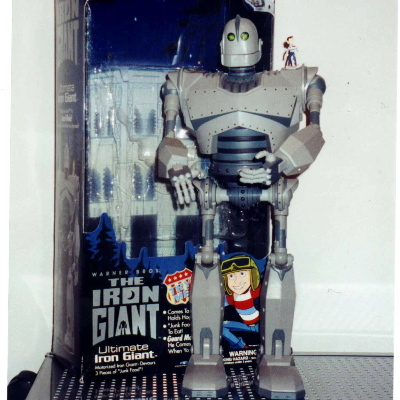 Above left: Trendmasters made a number of Iron Giant toys, including this 10 inch walking version. Push one button on the two button, wired remote control, and he would walk, and make outer space noises, and his eyes lit up. Push the other button, and his chest would spring open and launch a plastic disc, eyes flashing, alarms warning of the shift to battle mode. Shown in front of the control box is a 4 inch plastic, articulated Iron Giant that was packaged with the VHS movie tape. Above middle: Chest open, eyes flashing, preparing to launch the disc. Above right: Trendmasters' Iron Giant and Robby the Robot used the same two button remote control. 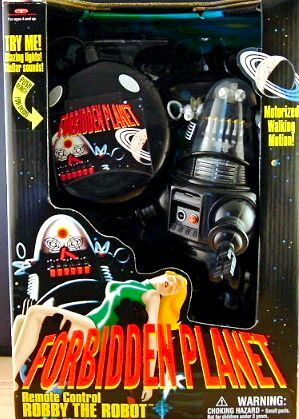 Robby's made him walk and say three phrases from the movie Forbidden Planet (see Robby the Robot). Above left: Trendmasters' rare, Classic Jupiter II. The top removed, and figures of Will, Dr. Smith, and B-9 robot fit inside. It also featured red LEDs and launching sounds. 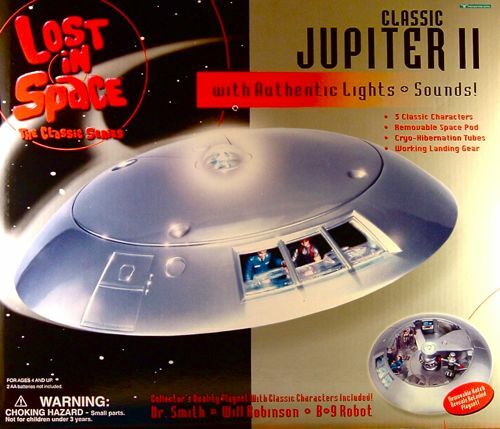 Also known as the Jupiter II Playset, it originally retailed at under $50 (see Lost in Space). 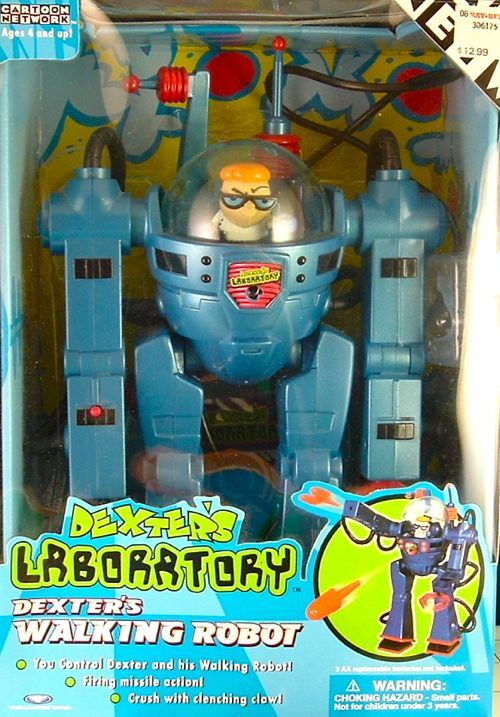 Above middle: Dexter's Walking Robot came in a Cartoon Network- branded box, and sold for under $15 at Kay-Bee Toys in 2000. Dexter could be seated in the robot dome. Pressing the red button on his right arm manually fired a missle. The "mega firing chest missile", however, was fired by pressing the red button on the control box. His left arm had a manual "clenching claw". Above right: Dexter also used the two button Trendmaster control box. One button made the robot walk, and the other fired the chest missile. Charlie took this 2003 picture of the robot gang. Except for three tin models dating from the '60s, all of the robots shown here came out after the Lost in Space movie in 1998, leading to a new millenium of great robots. Robot collecting is a hobby for every budget, with robots available from the price of a haircut to the cost of a car. Above left: Robot Lilliput, a wind-up robot from Japan, circa 1939, is believed to have been the first toy robot. Mint with box, it went for $2,000 in 1999. The above shown green variation released through Schilling was available in 2008 for less than $20. Repros were also made in the original orange. With Lilliput is a mini Robosapien from Radio Shack, symbolizing the future of robotics a half century later. 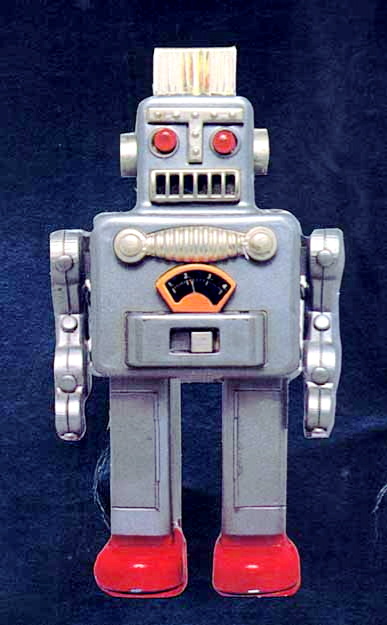 Robosapien, invented by Mark Tilden for Wow Wee Toys, used his BEAM technology (Biology, Electronics, Aesthetics, Mechanics), and was arguably one of the first affordable robots to cross the line from a toy to a fully interactive robot. Above right: Yonezawa Smoking Spaceman, an all- time classic robot from 1960 could fetch $3500 with a mint box in 1969. But HaHa Toys created affordable repros in 2007 that sold for under $100. Above left: Chief Robotman was one of a variety of battery operated 'skirted' robots that included Masudaya's Gang of Five. Yoshiya's 1959 creation was the perfect robot, with a turning head, spinning antennae, lit top light and mysterious "bump and go" action. Mint in box in 1999, it went for $2500. Design variations included Cragstan's Radical Robot, Chief Smokey, Mighty Robot, and Mystery Moon Man. Color variations were also introduced in 1960. 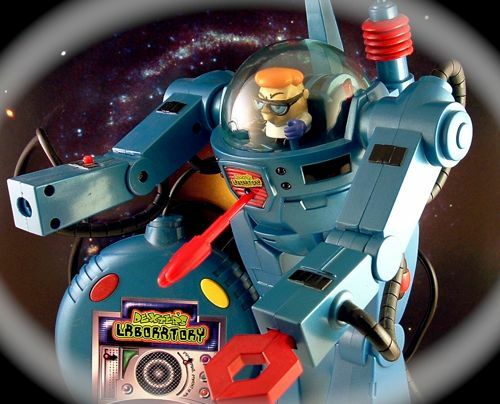 The robot shown is a repro of Chief Robot Man made in 2007 by Ha Ha Toys. The first 2007 version was silver, followed by this blue variant. On his left and right are two bonafide robots from the 'fifties. On the left, Hook Robot by Waco, in the rare silver/ blue variation. A small hook stuck out of the back of his head (not shown). He was friction, and when pushed, his head moved from side to side. On the right is Atom Robot by Yoshiya. He had a crank in the bank, and once revved up would move rapidly with "bump and go" "mystery" action. Above right: The box for Ha Ha Toys' Chief Robot Man duplicates the feel of the Yoshiya original. Unlike the box picture, the eyes don't actually light up, although the top lamp does. This well- made, battery -operated, metal robot is otherwise an exact replica and sold retail in 2008 for around $70 at Robot Island (see links). Above left: Real battery-operated tin robots had been unknown for thirty years when Rocket USA introduced R-1 for the new millenium. At over a foot tall, this skirted, colorfully-lithographed giant's eyes and ears flashed while it made mechanical sounds and sped around the floor with bump-and-go action--all kinds of classic robot stuff, and still about $40 retail. R-1 came in blue or gray versions, with a red model available through the Red Toy Company, a yellow "rescue" version, and in a limited edition bare-metal Millenium model. Above right: While lacking the detailing of its predecessors, R-1 nevertheless is an impressive robot, its eyes and ears blazing from an internal lamp, as shown here. Many were made and sold, and this popular robot is still affordable and available.